New, smaller components. The plugin is made of little components (box, buttons, etc), and we’ve simplified and cleaned those up to use fewer bytes in HTML markup and CSS. The total CSS is reduced to the point of being small enough to go in the HTML as a styletag. This may seem controversial (external stylesheets can be cached, inline styles cannot), but in our experiments we’ve seen it’s better to have the (small amount of) CSS inline. Otherwise the browsers block the rendering of the page, waiting for yet another HTTP request to complete. As you can see, there are much fewer resources now: 4 down from 15. The whole plugin loads in 0.5 seconds, as opposed to 2.3 seconds (a 4x improvement). Additionally, the perceived performance is better because the first paint (initial impression) is now at 0.3 seconds, as opposed to 2.1s (a 7x improvement!). Finally, the total payload in terms of bytes is 46K, or 5x fewer bytes than before (when it was 245K). We have more requests because of the friend’s photos, but the initial paint is 0.3s (was 2.1s) and the onload fires at 0.75s (was 2.4s). 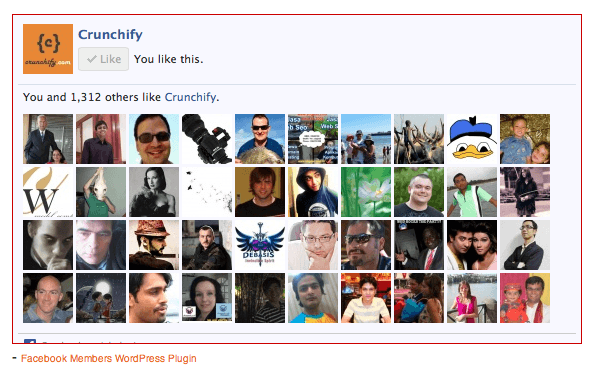 My Facebook Members WordPress Plugin is fully compatible with this change. There isn’t any update required. i really frustrated by this thing. Without likebox widget my page scores in the range of 2sec while with likebox it goes up to 4sec. I am using opencart, any solution guys? Hi Queenie – Thanks for posting your concern. I would say, there are multiple factors which may affect your page loading time, i.e. Hosting, # of script loading, # of plugins you are using on your blog. I see you have very nice site. Also, try consider using CDN service.